Throughout her career, Tift Merritt has always come across as an artist with an independent streak. Not one to be tied down, the North Carolina born singer-songwriter has numbered France and New York City amongst her places of residence and frequently has not been in a position to be dictated to by major labels. This hasn’t prevented her from recording four previously acclaimed albums that have all possessed the promise of her ultimately becoming one of the most influential exponents of female singer-songwriter Americana music. With this background, the title and themes to the newly released 5th studio album TRAVELING ALONE are subtly appropriate especially as the project was initiated without any label in place. This has been corrected by hooking up with Yep Roc Records and together they have a fabulous set of songs for Tift to continue her progression to esteemed levels. While the experiences of the songs reflect her inner thoughts, it has been far from a lonely adventure and Tift has assembled some fine musicians to assist her, all under the stewardship of producer Tucker Martine, who has previously worked with The Decemberists. Amongst these is Eric Heywood and his extensive Pedal Steel input is far more prevalent than what has been featured on Tift’s previous recordings and thus a drift away from the metropolitan sound towards that more aligned with her southern rural roots. It is only towards the latter stages of the album when the more extensive overtures of electric guitar take hold in tracks such as ‘Spring’ and ‘To Myself’. However the soul of the record is very much in the opening songs which have the potential to become stalwarts of her set list in years to come. The title track ‘Traveling Alone’ is set to become the record’s flagship song and central to its promotion. The beautiful vocals of Tift accompanied by a light acoustic guitar sound are the prominent features of this song which reflects her emotional state at the outset of making this record. The second track ‘Sweet Spot’, especially in the opening bars, resembles her classic composition ‘Broken’ from the ANOTHER COUNTRY album and sees the introduction of the steel sound which creates a sweet and tuneful relaxing ambience. ‘Drifted Apart’ continues to contribute to this atmosphere which peaks in the mid album number ‘Too Soon To Go’ with its splendid chorus hook leading you to regularly hit the repeat button. TRAVELING ALONE is an album that doesn’t create an aura of loneliness and this is exemplified by the steel-laden song ‘Feeling of Beauty’ with its repeated line “if it’s alright by you, I’ll stay on another couple of days” and the theme of the previously mentioned standout track ‘Too Soon To Go’, suggesting a reluctance to move on. Like so many eminent Americana artists, the independent non-conformist spirit of Tift Merritt will always place her on the peripheral of the mainstream. However her ability to make music that blends the traditional and the new with exquisite vocals and appealing songs will continue to ensure plenty of industry praise is lavished. 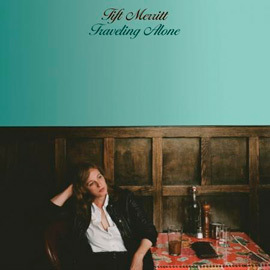 TRAVELING ALONE is further evidence that Tift Merritt is continuing to make progress on the ultimate career journey towards influential status.